Racehorses can run 100m in half the time it takes the fastest humans on the planet to do so at top speed, which puts them amongst the fastest animals on the planet. Possessing both great speed and stamina, racehorses in full flow are a true spectacle to behold, whether you are watching Flat horses or jumpers. 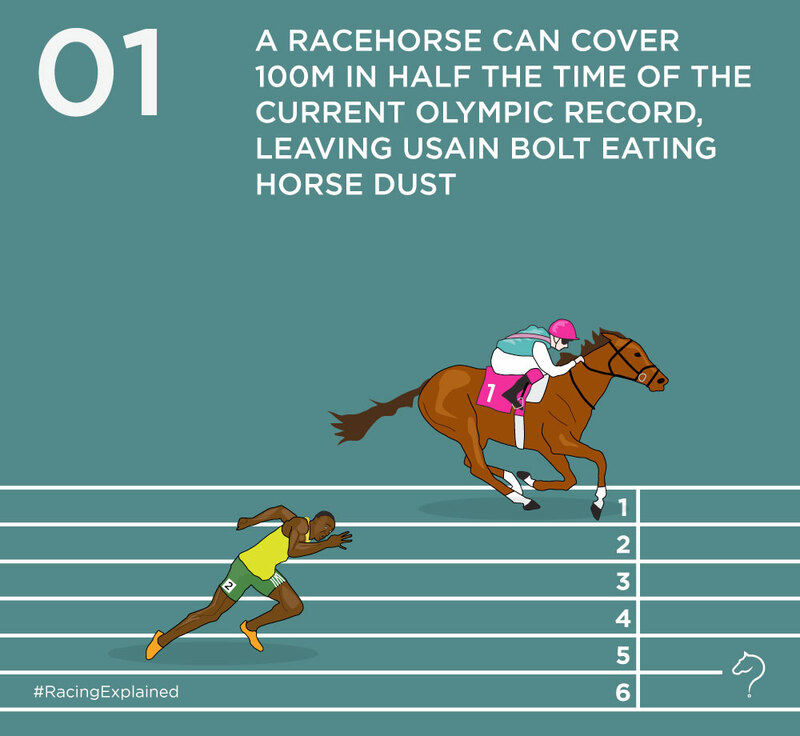 Why are racehorses so fast? Racehorse speed is a product of both nature and nurture or, in other words, a combination of biology and diet. Biologically speaking, horses of all kinds are strong runners because, in many ways, they are built for speed. The lower part of a horse’s leg is comprised of tendons and ligaments around the bone, rather than the muscles you would find in humans and other mammals. These tendons and ligaments help horses run at a quicker, steadier pace. When it comes to diet, owners must not only consider the broad nutritional requirements of their racehorse, but also how to best provide them with enough fast-release energy to allow him or her to race at the top of the sport. A horse must be fed the correct diet of high-quality proteins, fibre, starch and fat in order to have enough fuel to race at such speeds. Who were the fastest racehorses in history? Among the fastest racehorses to have ever lived are famous names like Secretariat, Man o’ War, Seabiscuit, Black Caviar, Valiant Pete and Winning Brew. The highest race speed in recorded history, recorded over two furlongs, is 70.76km/h. This was achieved by Winning Brew in May 2008 at the Penn National Race Course in Grantville, Pennsylvania, USA. Trainer Francis Vitale took much of the credit for helping Winning Brew become so exceptionally fast. American Thoroughbred racehorse, Secretariat, on the other hand, still holds the record for the fastest recorded time achieved on dirt. In 1973, he was the first winner of the Triple Crown in 25 years and his victory in the Belmont Stakes is widely considered one of the best races of all time. Seabiscuit, who was immortalised by a Hollywood film starring Tobey Maguire, was a champion racehorse in the USA known for his outstanding top speeds and, in 1938, he was voted American Horse of the Year for his achievements. In Britain, the five-furlong handicap sprint, the Epsom Dash run at The Jockey Club’s Epsom Downs racecourse, is one of the fastest races in the sport. The lack of obstacles on the Flat mean that runners, aged three years or more in a maximum field of 20, can reach astounding speeds – in fact, the current official Guinness World Record for the fastest racehorse over five furlongs was set in the Dash by Stone of Folca in 2012. What happens to racehorses after they retire? What does a racehorse eat and drink?